Standard features include: Three controls (room thermostat, timer, combination bonnett control), blower and motor, fiberglass filters, one ash receptable. Available options: dual fuel unit burns either coal or oil, conventional thermostat system, coal-trol digital thermostat system, domestic statinless steel hot water coil. KEYSTOKER Forced Warm Air Heating Units can give you automatic heating at the lowest possible cost. You can definitely benefit by the use of anthracite coal and at the same time eliminate the time and work demanded by hand-feeding. A large silent air circulating blower will assure complete circulation of warm, filter-cleaned air throughout every room in the house. The KEYSTOKER Warm Air Furnace is built to deliver maximum heat at the lowest initial investment and lowest operational cost. 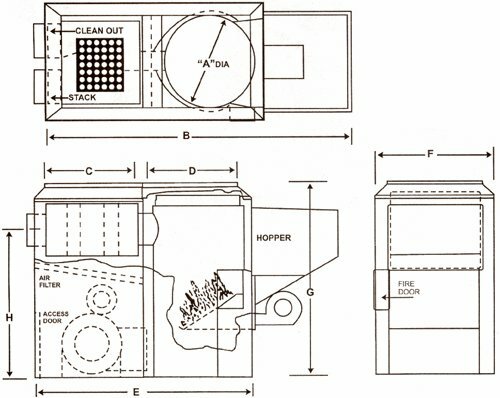 The down-draft heat exchanger increases heating surface, permitting direct circulation of every thermal unit of heat into the warm air leader pipes for rapid distribution. 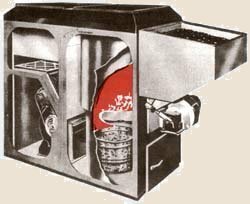 The heating surface is properly proportioned to the grate area, resulting in appropriate balance and greater heat delivery per pound of fuel burned. Fibre Glass air filters can be easily cleaned or replaced at a low cost. The Keystoker blower has been expertly engineered and designed to give many trouble-free years of silent operation. An optional stainless steel hot water coil is available. Includes a sealed pit ash removal, assuring clean, dust-free operation. Standard equipment includes: three controls, room thermostat timer, relay and (unreadable word) control, blower and motor, fiberglass filters, and two ASL receptacles. Stainless steel water coil will pre-heat water heater within 10' of furnace. No Moving Parts in the Fire Box. Long life automatic heat without costly repairs. Burns two sizes anthracite coal. Low cost fuel is the key to heating economy. Reliable. Heavy duty factory built gear box. Quiet operation. 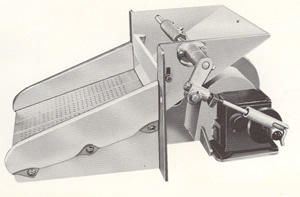 Belts, shear pins, and worm conveyors have been eliminated. Rugged construction. Entire unit factory assembled and fully tested.